Bull fighting, as it is called in Rodeo, is one of the most dangerous aspects of this sport. 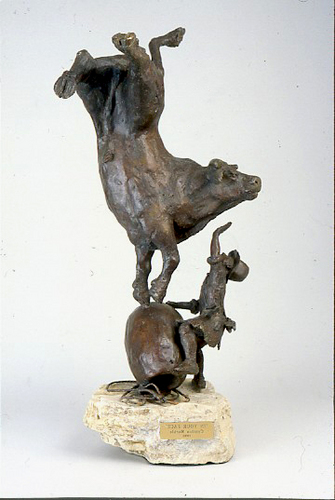 The clown or bull fighter, out of the safety of his cushioned barrel, is caught in an instant of time as he grasps its edge and feebly holds up his hand against the 2000-plus pound bull as he balances on the side of the barrel. Will the bull drop back and down or will his great momentum carry him smack dab into the face of the unfortunate clown? This very instant of time depicted requires the veiwer to decide the fate of the bull and the clown.